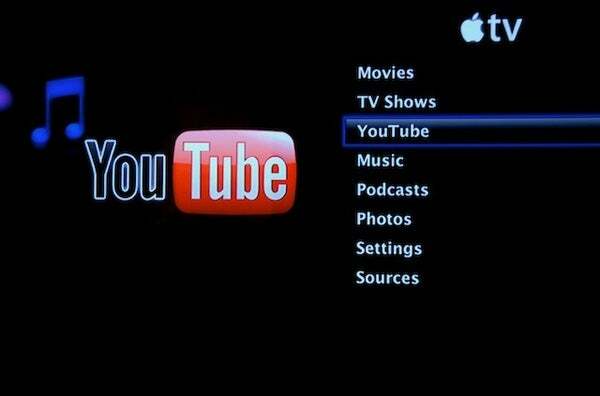 Apple delivered a promised Apple TV update Wednesday that allows the company’s set-top box to play YouTube videos. As soon as I heard the news I broke out the digital camera and Apple Remote to see just what this update brings to the table. Here’s what I found out about updating the Apple TV’s software and putting its newfound YouTube compatibility to the test. 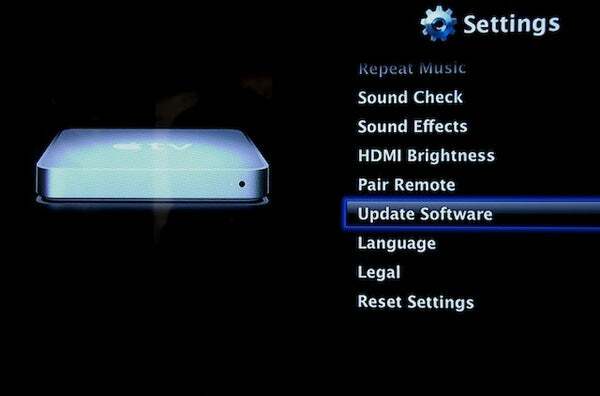 The actual process of updating the Apple TV couldn’t be much easier. Simply navigate to the Apple TV’s Settings screen from the main menu, select the Update Software command, and press Play/Pause. The Apple TV Update page appears and tells you that an update is available. (This appears to be the only way to check for updates; the Apple TV doesn’t automatically pop up a Software Updates notification window similar to a Mac’s.) Choose Download Now and press Play/Pause to begin downloading the update. Over my 802.11g network, the update took around 12 minutes to download. The Apple TV indicated what it was up to via a Downloading Update command in the Settings screen. When the download completed the Apple TV Update screen reappeared, and I was offered the option to Update Now or Update Later and warned that when I updated I should not unplug the Apple TV. I chose the Update Now option. The Apple TV restarted and displayed the Apple logo and the kind of progress bar you see on a Mac performing a firmware update or on a display-bearing iPod when it’s updated with a fresh version of its operating system. A progress bar appears as the Apple TV updates. 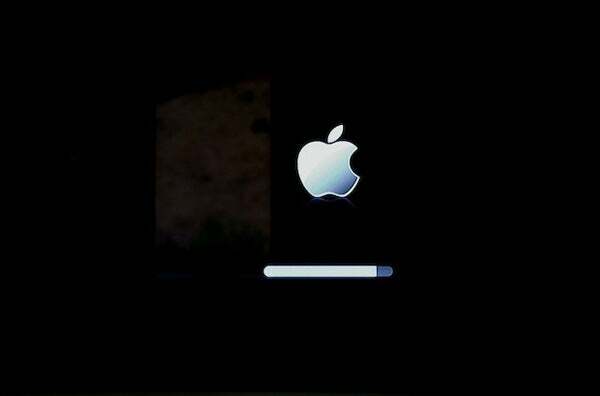 The Apple TV restarts yet again when the progress bar completes its journey; the status light on the front of the device displays a flashing amber light for about 30 seconds before the screen displays the Apple logo and runs through the start-up animation. When the Apple TV is fully restarted, you see that a new YouTube command appears on the main screen, between the TV Shows and Music commands. After the update, YouTube joins the list of menu commands. When you select that YouTube command and press Play/Pause on your remote, you’re taken to the new YouTube screen that includes Featured, Most Viewed, Most Recent, Top Rated, History, Search, and Log In commands. As you might guess, these commands do exactly what they suggest. Choose Featured, for example, and you’re presented with a list of YouTube videos that the Powers That Be have determined are worth your while. (These videos have several hundred thousand views each). As with the Apple TV’s other video media, you see a preview frame of the video on the left side of the screen with a description below. That description includes title, star rating, summary blurb, where the video originated, when it was added, its category (Comedy or Music, for example), tags, and number of views. Data of each video appears when you select YouTube content. To play a video, simply select it from the list to the right and press Play/Pause. The video will stream over the Web to your Apple TV and begin playing when the Apple TV believes enough of it has loaded to ensure smooth playback. After you’ve viewed a portion of a YouTube video it will be listed in the Apple TV’s History screen. Those whose viewing habits are monitored by parents or guardians will be pleased to know that this screen contains a Clear History command. Because YouTube has no control over the original source material the quality of these videos is variable. Just as over the Web, some look decent while others are terribly grainy. While watching a video, press Menu and you’re taken to a different YouTube screen. Here you’re given three options: Resume, Return to YouTube Menu, and Options. 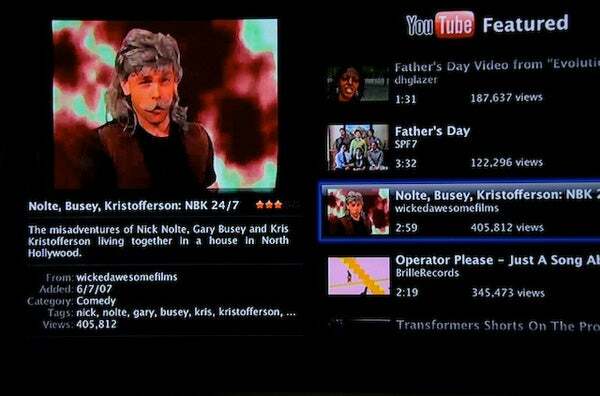 With some videos, you’ll see a list of related videos below this list that you can choose from. Those first two commands are obvious. The third leads you to another screen where you're allowed to choose three more commands: Rate This Video, Save to Favorites, and Flag as Inappropriate. Choose any one of these commands and press Play/Pause and you’ll be asked to enter your YouTube user name—if you haven’t done so already via the Log In command on the YouTube screen—before you can proceed. To log in, you use a virtual keyboard exactly like the one the Apple TV uses for logging into a protected network. 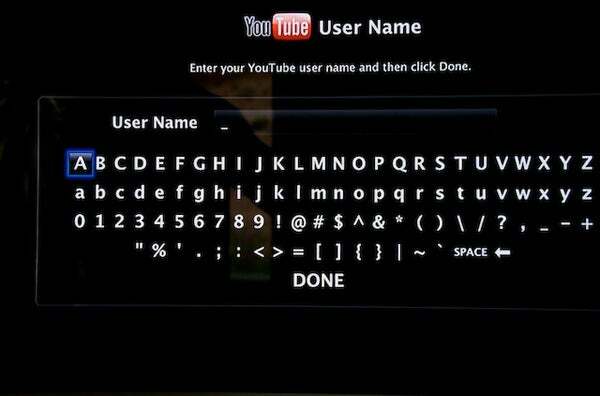 You’ll use this keyboard twice—once to enter your YouTube user name and again to enter your password. You use the remote’s direction buttons to move around and hit Play/Pause to enter the selected character. Click Done when you’re finished in each screen. Use this virtual keyboard to log in to YouTube via Apple TV. The Apple TV offers a more limited keyboard to search YouTube content. Rather than providing both lower and upper case letters and a wealth of odd characters, this one provides just the alphabet in lower case, digits 1 - 0, and an option for adding pound, equals, and plus characters. I found this keyboard to be unresponsive. Several times I tried to navigate down to the third row of characters from the first row and it simply wouldn't happen. I’d hear a beep indicating the Apple TV had received the command, but the display wouldn’t change. Pressing the down button again caused the selection to move down two rows. Attempting to move up a row was no better. Eventually, by trial and error, I was able to select the characters I wanted. When searching, don’t expect to find everything YouTube has to offer. As indicated when Apple and YouTube first announced their partnership last month, only some of YouTube’s content has been converted to the H.264 video codec favored by Apple. For example, a few YouTube videos are tagged with my last name. Yet searching for “Breen” via the Apple TV menu returned no results. Likewise, entering “Music” produced nothing either. So this is a work in progress. YouTube expects to have its full catalog available in H.264 format by this fall. Let’s say you watch a video and want to save it to your favorites. Choose the Save to Favorites command—you’ll be prompted to log in if you’re not already signed in. Here you’ll see the big keyboard screen I mentioned earlier. Enter your user name and then, when prompted, your password. Password characters appears as dots rather than alphanumeric characters in the Entry field. You can also log in from the YouTube screen. When you select this command and press Play/Pause, you’re taken to the YouTube Log In screen. Here you see at least two commands if you’ve already logged in once: Other Account and Remove Account. Select Other Account and you can log in with a different YouTube account—good for when a household has lots of YouTube members. You can also remove an account via the command of the same name. If you’ve logged in with an account, that account name will appear in this Log In screen. Choose it, and you’re prompted only for your YouTube password. Once you’re logged in, you see a new Favorites command on the YouTube screen. Select it and press Play/Pause and you’ll see a list of your favorites. , for example. When you log out, the favorites command disappears. That way, no one else using the Apple TV can see your favorites when you’re logged out. At this point it appears that the YouTube command is a nice, yet not fully implemented option. Given that YouTube's full catalog isn’t yet available and searching is a little glitchy, Apple TV owners will gain the most immediate satisfaction by browsing the Featured, Most Viewed, and Top Rated YouTube videos. By following that strategy, I’ve already found three videos worth adding to my list of favorites.